What is considered a successful call center? The definition can be discussed at length at any seminar, blog, tweet chat, staff meeting, etc. 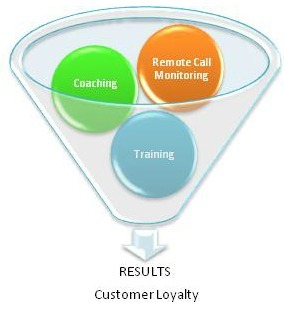 For the basis of this blog, a successful call center encourages customer loyalty. There I said it, loyalty, not satisfaction. In a recent infographic, it portrays the customer experience relating directly to customer loyalty. As any call center expert can tell you, that customers remain customers, if they are happy with the service they have received from agents. But what a lot of call centers don’t know is how to achieve that status. There are 3 major keys that can assist agents in reaching customers and obtaining their loyalty. They are as follows: Call Monitoring, Coaching and Training. Call monitoring can be done internally or by a 3rd party. Using a 3rd party can provide you with a customer-centric, unbiased look into how agents are handling customers. Once you have evaluations that are objective and measurable, then the agent needs to be able to understand it and then move their performance forward. All the evaluations in the world cannot help agents, unless it is followed up by training and coaching. Once a needs analysis has been done by monitoring calls, a trainer then can go in and focus on the pieces that need help and celebrate the great things that agents are currently doing. Training is vital in ensuring agents are aware of what is expected in handling customers. Agents need to have the understanding on how to personalize the interaction versus just processing the call. Once the agent is trained initially, then follow-up training must come into play. Follow-up training is done through coaching the agent by their supervisors and managers. As all great sport coaches will tell you, the key to having great players is to show them how to do things better and praising their victories. There is no difference between a football coach and a call center manager … just a different game is being played. Once you have great coaches on the call center floor giving great advise and kudos to their agents, this experience will spill over to the treatment of customers by the agents. These 3 factors will change behavior and move forward the performance of agents within any call center environment. The behavior change will produce more than just customer satisfaction, it will produce customer loyalty. Next Post What needs to be Present for a Customer to be Satisfied? I agree those are the key to success in call center most of the call center companies give their agent an opportunity to learn to things,in Finland country coaching and training is one of their key to success.